The DOL has removed appraisals entirely—not just ESOP appraisals—from fiduciary treatment in its final rules designed to strengthen retirement security. The provision is part of extensive rules that require brokers and other advisers providing investment advice on retirement accounts to adhere to an ERISA-based fiduciary regimen. The proposed rule carved out just ESOP appraisals, but the final rules exempt all appraisals and fairness opinions (see our prior coverage). The final DOL rules are extensive and deal with many issues, so here is a White House fact sheet. More to come: The appraiser-as-fiduciary issue is not completely put to rest. There will be separate future rule-making on the issue of appraisals and fairness opinions in the context of investment advice subject to the fiduciary requirements. In the meantime, with regard to ESOP appraisals, the DOL has made past remarks that everyone will "do well to take notice of" the DOL/GreatBanc Fiduciary Process Agreement that covers ESOP transactions and valuation issues. Although the agreement formally applies only to GreatBanc, it serves as an overall “playbook.” For example, it stresses the importance of documenting the reasonableness of management projections and that, if the valuation advisor does not do his or her job in this regard, the trustee should do it. After the GreatBanc agreement was issued, valuation analysts began to incorporate relevant parts of it into their reports, such as additional boilerplate language and more explanation and documentation. You can get a copy of the actual agreement here, or you can purchase a version with commentary from the attorneys who negotiated the agreement here. After all the attention La Verghetta, a New York statutory fair value case, and Walsh, a New Jersey case, have received from the valuation community, what more is there to say about the courts’ DLOM rulings? Perhaps this, says Sylvia Golden, BVR’s legal editor and co-host of a recent BVLaw Case Update webinar that discussed both cases. In contrast, when the plaintiff in Walsh makes this argument—that there should be no DLOM because none of the parties planned to sell to a third party—it has no traction with the court. The real issue is equity, the court in Walsh says. “[C]onsistent with the demands of equity, the oppressed shareholder should not be forced to hand the oppressing shareholder the windfall of an undiscounted price, leaving the oppressed shareholder to shoulder the entire burden of the company’s relative illiquidity,” the court says, citing the controlling 1999 Balsamides case. In Walsh, the plaintiff (selling shareholder) was found to be the oppressing shareholder—a ruling neither party in the case ever contested. In Balsamides, the court dismissed the defendant’s theory—that there was no marketability issue because there was a designated buyer, the plaintiff-oppressed shareholder, who was not buying an interest that might result in a later sale to the public—as an “erroneous assumption.” The problem was that the oppressed shareholder was buying a company “that will remain illiquid because it is not publicly traded and public information about it is not widely disseminated,” the court said. Just because the plaintiff-oppressed shareholder is the designated buyer does not mean he should “bear the brunt” of the company’s illiquidity. Takeaway: There is no bright-line rule for the use of DLOM, at least not in New York and New Jersey. Much as valuators dislike the vagueness that comes with concepts such as fairness and equity, the courts use them as guideposts when navigating through the waters of valuation. Extra: Diehards who are looking for more analysis of the La Verghetta case can find it in Chris Mercer’s series on Statutory Fair Value and Business Valuation, Blog Post No. 8. What does Mercer think the future holds for the DLOM in New York statutory fair value determinations? "I don’t know, but we will see,” he says. "I’m guessing that over time, there will be a gravitational pull towards nil or small marketability discounts. Logic doesn’t work for large discounts. And the trend in other jurisdictions is clearly toward no marketability discounts at all." The concept of compensation forfeiture is an option that damages plaintiffs can seek that is not difficult or expensive to prove. Plus, it can be “stacked” onto other remedies, according to George P. Roach, J.D., who practices almost strictly in damages and remedy law. In an interview in the May issue of Business Valuation Update, Roach also points out that, in some cases, compensation forfeiture may end up to be the only form of damages that can be proven with reasonable certainty. Roach is the author of a new chapter on compensation forfeiture in the newly released fourth edition of The Comprehensive Guide to Economic Damages. The FASB has issued Accounting Standard Update (ASU) No. 2016-09, Compensation—Stock Compensation (Topic 718): Improvements to Employee Share-Based Payment Accounting. The ASU is designed to reduce the cost and complexity of the accounting for share-based payments; the amendments are expected to significantly impact net income, EPS, and the statement of cash flows. PwC has issued a special report on the impact of the new rules. In the pink: For multispecialty ASCs, 78% of the respondents reported multiples of 7.0 to 8.0 times EBITDA when purchasing a controlling interest. When purchasing a controlling interest in single-specialty ASCs, 73% said the prevailing valuation multiples were 6.0 to 7.9 times EBITDA. Most respondents are willing to pay a premium for ASCs with a certificate of need (CON), with 56% reporting they would add a premium of 0.51 to 1.0 to the typical multiple. The survey includes responses that represent more than 700 ASCs throughout the country. Add two informative BVU articles about Pratt’s Stats. You’ll find these updates on the Subscriber Services page. If you’re not a subscriber to Pratt’s Stats, maybe it’s time to take a look. The International Valuation Standards Council (IVSC) has issued four exposure drafts that are part of the new version of IVS (IVS 2017). They are: IVS 104 Bases of Value, IVS 105 Valuation Approaches, IVS 210 Intangible Assets, and Introduction and Framework to IVS 2017. There is a 90-day comment period for these exposure drafts. The remaining chapters of IVS 2017 are expected to be released as exposure drafts this May or early June, with the final IVS 2017 expected late this year. The IVSC also has issued a set of IPS exposure drafts that are now open for public comment. The International Professional Standards (IPS) are designed for valuation professional organizations (VPOs) and are standards that govern the competency of valuation professionals, through codes and benchmarks for their conduct, capability, and competency. They are particularly useful to new and developing VPOs. After a three-month comment period, finals will be published this fall. Once a luxury service for few travelers, flying has become a commodity. Very generally speaking, airline brands are no longer “love” brands, but they are still competence and reputation brands that reflect the technical aspects of flying, safety requirements, and the positive aspects of traveling. However, air transportation is an extremely competitive business globally. Although the market is growing steadily, the available aircraft and seat capacity is increasing at the same pace. Cost savings, rationalization, and profitability is a frequent and steady challenge for airlines. 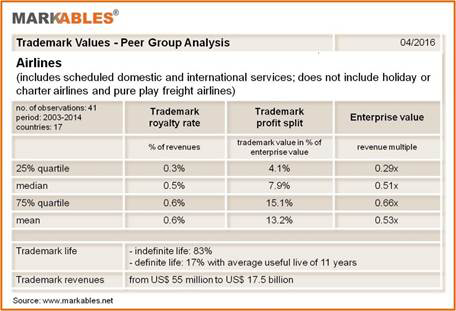 This month’s peer group analysis from Markables illustrates trademark comparable data for 41 airline brands from 17 different countries. In this sector, trademark royalty rates are very low, ranging from 0.3% to 0.6% on revenues, with a median rate of 0.5% (see chart below). Based on these royalty rates, trademark accounts for approximately 8% of enterprise value. Average enterprise value multiples for the sector are 0.5x revenues, illustrating the weak profitability of the sector. Two takeaways: There are two key takeaways from this snapshot. First, trademark royalty rates are surprisingly but consistently low, despite high brand awareness and marketing expenses of airlines. The analysis illustrates however the strong correlation between the value of intangible assets and the long-term profitability of a business. Companies with low profitability have little room in their financials to account for high values of intangible assets. Second, there is a case of a defunct Indian airline business that is subject to current government investigations on eventual fraud (Kingfisher Airlines). The brand was valued back in 2009, and apparently the valuation that was used to pledge and collateralize the brand was very high. A few years later, the brand turned out to be of no or very little worth. Using comparable data for previous transactions and purchase accounting helps to avoid such cases. People: Don McLean, based in the Baton Rouge office of Postlethwaite & Netterville, was promoted to associate director in the Accounting and Assurance Services Group. This is Part 1 of BVR's Special Series presented by The Comprehensive Guide to Economic Damages.